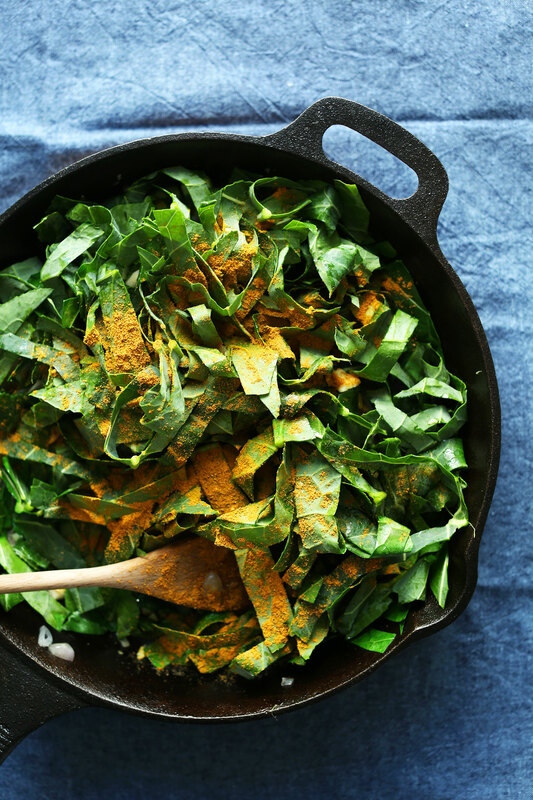 Add collard greens, half of the curry powder (1 tsp as original recipe is written), coconut sugar, and a healthy pinch sea salt. Stir to combine and reduce heat slightly to medium-low. Cook for 4-5 minutes, stirring occasionally, or until greens appear tender but not mushy. Add kale, another pinch of sea salt, remaining curry powder (1 tsp as original recipe is written), and the coconut milk. Stir to combine and cover once more to steam for 2-4 minutes, or until kale appears tender. *3 cloves garlic yield ~1 1/2 Tbsp minced garlic. *Method adapted from Real Simple and All Recipes. *Nutrition information is a rough estimate calculated without optional coconut flakes. I made this today and it was yummy! I used swiss chard stems instead of collards and swiss chard leaves instead of kale. Also added paneer and extra coconut milk. So good! Froze it and it defrosted great. Thanks for sharing your recipe changes, Mindy! rave: this was so simple and good. To make it a meal instead of a side, I cooked red lentils (they cook up so fast) in another pot while I was making the coconut collards, and doubled the onion, garlic, ginger, curry, and used a whole can of coconut mile – because I knew I’d be adding the lentils and would need this to retain the flavor. Yum! I also threw in some cashews for fun. my only complaint is that there are so many comments and ratings from people who never made the dish – it makes it hard to get a sense of how it really is, instead of how people will think it will. I appreciate the guidance you give to commenters and hopefully people will read that. I will admit that I made this tonight and ate the whole pan and had to make more for lunches this week. So, the second time I made it with purple cabbage and it was still F*cking delicious. I made this twice. I followed the directions exactly the first time and, as I suspected, the curry tasted a bit harsh. The second time, I bloomed the spices with the onions so the flavors would come out a bit more and not be so harsh. oh, my goodness! I made this for dinner tonight. I quadrupled the recipe, because I didn’t know what to do with the other three quarters of a can of coconut. I used only kale, and it nearly cooked down to nothing. It is awesome! I love coconut anyway, and I love greens. Who would have thought that kale, coconut milk, and coconut sugar would be so stinkin good! I don’t have collards or kale on hand but I do have frozen spinach (always on hand!) so I plan on making this tonight with that and see how it goes. Thanks! Also, unrelated question/request. I recently, on an impulse, purchased a bag of coconut flour (from Trader Joes). I don’t eat eggs, but haven’t been able to find a single egg-free baking recipe with coconut flour. Please would you be able give something? Thanks so much for your recipes! I was wondering what you do with the leftover coconut milk? Does it store well? I would like to make the recipe, but I would hate to waste most of a can. Hi! Leftover coconut milk will last up to a week in the fridge with no depreciation in quality. You can also use coconut milk in many of our other recipes, so if you plan your meals accordingly – one can will go a long way across multiple meals! Happy Cooking! well once again, I follow the recipe. But there was no large kale or collard greens at my store or farmer’s market; I went to a place called Price Rite and bought to 1lb bag of each. By the time I was rid of the stalks, it was about 1 and 1/2 lb combined. The Kale was not baby and it took about 20 minutes to cook and the collard took just as long. I am assuming it was a double batch so I added a 3/4 can of light coconut milk with a little water. It worked. The spices were good, but I added garam masala and some chili powder. It is to die for. update; I let it sit for an hour (was too early to eat dinner); maybe it was the powder curry but all I could taste was powder. the whole thing was thrown out. I think next time I will make it without curry powder; maybe use a paste. Or it could of been the vegetables; I don’t know what went wrong but it wasn’t for me. This was yummy!! I made it tonight! And I got enough for lunch tomorrow! Will make again! Would regular coconut work out fine for this or is it too thick? Hi! Are you thinking in place of coconut milk? Yeah, I’m afraid that would be too thick! Happy cooking! Woops I totally forgot a word there! I meant regular non-light coconut MILK, not a full coconut. Phew! :) Regular coconut milk should work just fine! You might find that it might be a little thicker? But let me know how it goes! Definitely a thicker consistency, but still enough to coat the greens nicely! Delicious recipe! Thank you for this recipe!!! I just ate this and had to stop myself from eating ALL of it. I only had tuscan kale on hand, but any hearty green would work. My toddler liked it too. I will be making this one again and again. Would this be just as good with dinosaur Kale? Yumm! Just made it, just ate the whole thing by myself. :) Thank you for all the delicious recipes! Best greens I have EVER had!!! So much yummy umami flavor from greens-unbelievable! Thank you for coming up with such healthy, tasty recipes. My diet has become way more plant-based mostly because of you! My body and heart thank you ? I love the smell of coconut milk in my food, thanks for sharing. A’l try it out…. Made this for dinner last night for my hubby and myself. I had mixed greens and spinach on hand so used them. I had to use vegetable broth since I forgot that I had already used my coconut milk for another recipe. This was amazing! We loved it and can’t wait to try it with coconut milk since that is my favorite flavor with curry. Thank you for sharing this recipe, it will be a regular addition to our weekly menu. fantastic! I used all the bits of greens I had in the fridge (asian greens, baby bok choy, swiss chard and a head of kale), some on their last legs, and it still turned out wonderfully. Super delicious! Thanks! Made this last night, with silverbeet and kale as it was all I could find in the shop greens-wise. I will without a doubt be putting this one in the “Favourites” file. It might be gilding the lily, but I’m thinking maybe adding chickpeas, your new tofu cubes recipe or paneer next time for a one-dish meal? SOOOOO GOOD! 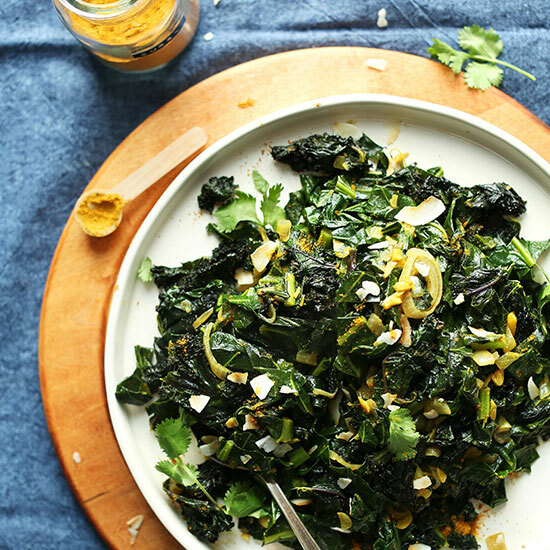 Amazing flavor combination- what a great way to get in a whole ton of greens. Honestly this turned out way better than I was even expecting. We ate it with yellow jasmine rice. Amazing recipe!!!!! These sound SO delish! I love coconut milk and greens are ALWAYS a good idea. Thank you!! OMG! Another winner! We had this for dinner this evening and it was SO GOOD! I chopped up 3 small onions before I looked at the menu again and saw that it was “supposed” to be shallots so I just dropped those but added the garlic and everything else as listed. It was out of this world. THANK YOU Dana! what an inspired set of ingredients! Love these flavors, I’m burned out on my sauteed spinach, etc, etc so this is very timely! Thank you for sharing this! This is kind of annoying question, but is there any way you can estimate about how many cups a large bunch of greens chops up to? I buy huge bags of chopped greens rather than bunches. I would wing it like I usually do when I’m cooking greens with veggie broth, but I’d rather measure out the coconut milk to try to get the ratio you used, which looks delicious! Not annoying! I’d say the chopped collard greens was 5 cups, and the kale was 4-5 cups (loosely packed). The good thing about this recipe is the amounts are flexible. If it’s tasting too strong, add more greens. If the flavor isn’t prominent enough, add more salt / curry powder! Wow, this looks really delicious, I might try this later on this week. This recipe is amazing, perfect for those days when I had too many Christmas cookies and cake. I’d probably add a few pieces of fried tofu to make it a main. I’ve done spinach (from the garden, not the flimsy baby stuff in a bag) with onions and regular coconut milk, but I’ll have to try with your addition of curry spices. Do you really need sugar? I have never even seen coconut sugar. The ginger also is a great idea. After the greens have wilted, I cook them a while with the lid off to work off the liquid, then add the coconut milk just long enough to get hot, so it doesn’t turn out too watery. You don’t, it just balances the flavors. You could sub stevia if you’re trying to avoid sugar. I made this tonight and loooove it!!! I think I ate half of the end product BY Itself, as an impromptu snack, it was so yummy. I used full fat coconut milk, as I love the creaminess of it, and I was not at all disappointed. Definitely to be repeated, and I kinda hope my partner doesn’t eat any of it so I can have the rest tomorrow! Love at first read. Had this for dinner tonight and my husband & I died and went to heaven! Yes, please! Unbelievable! Best ever. I am eating this right now! At first glance I knew I would make this recipe tonight. It’s winter on the Canadian prairies so our organic veg choices are a tad limited. I used broccoli and spinach. I came across a Cha’s Organics coconut milk flavoured with lemongrass and ginger that I had not seen before and decided to give it a go. I also added a quarter cup cooked organic french lentils to make it my full meal for supper. You totally made this blustery Monday much warmer. Stoked to eat the leftovers for lunch tomorrow. Thank you. I just recently discovered this site and my cookbook arrives tomorrow from Amazon. I love that you have a printer friendly version as with my printer I can not select just page 1-3 for ex. and the recipes are insanely delish!! Looks delicious! I’d totally use this with any vegetable! 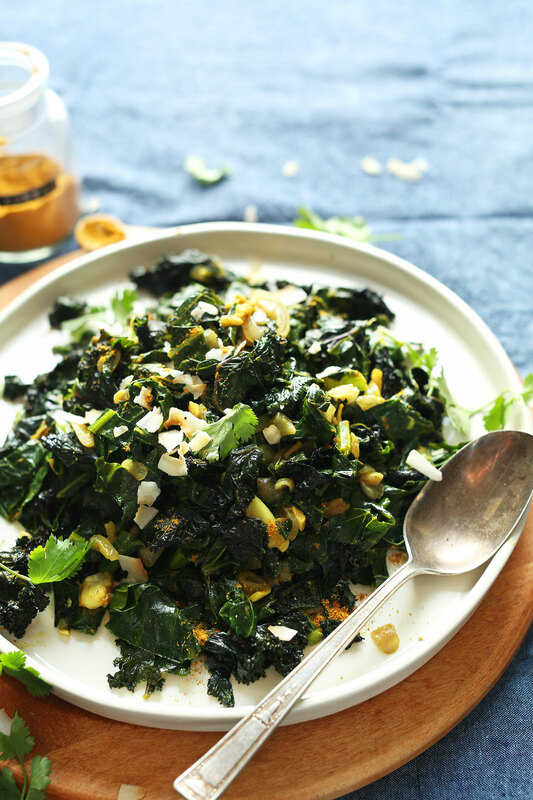 I’m on such a collard kick, must try these immediately. Also, just wanted to say that your blog is one of my very favorites. Thank you for making such beautiful and delicious content! Oh well this is incredible! Adding this to the meal plan now. Ugh, this looks like the kind of dish I want to have on hand at all times so I can eat it whenever I want. Seriously, this looks amazing. I’m taking it as a sign that I need a break from the kale/olive oil/garlic/lemon/chili flakes rotation I’ve been on for months. i have a thing for curry powder too…i have yet to try it on greens but my latest one has been with homemade noodle soup. Never even tried curry powder! I’m not intimidated by it, like it something only restaurants can use. Okay, time to try it and step up my A-game! This looks scrumptious and healthy. #CURRYPARTY!! 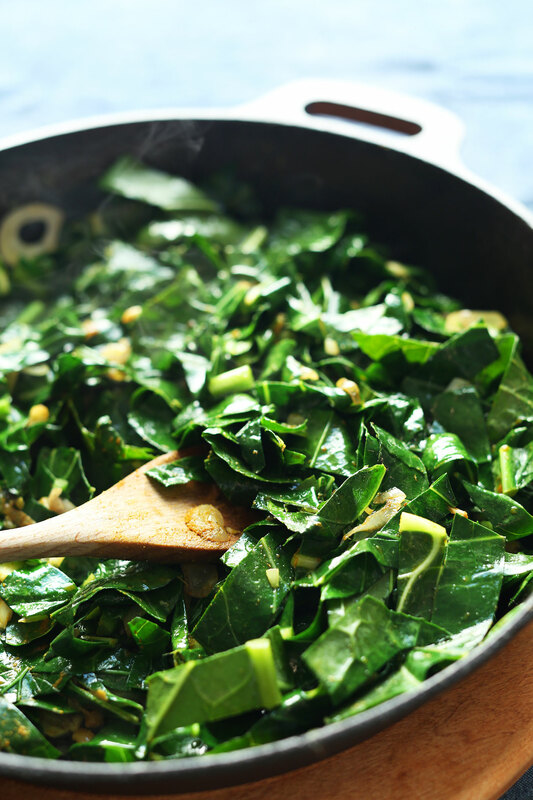 These greens look amazing, Dana… they look insanely flavorful but I love that they’re healthy too! :) Cheers! Delish!!! I can clearly see I’m going to have to make this asap! 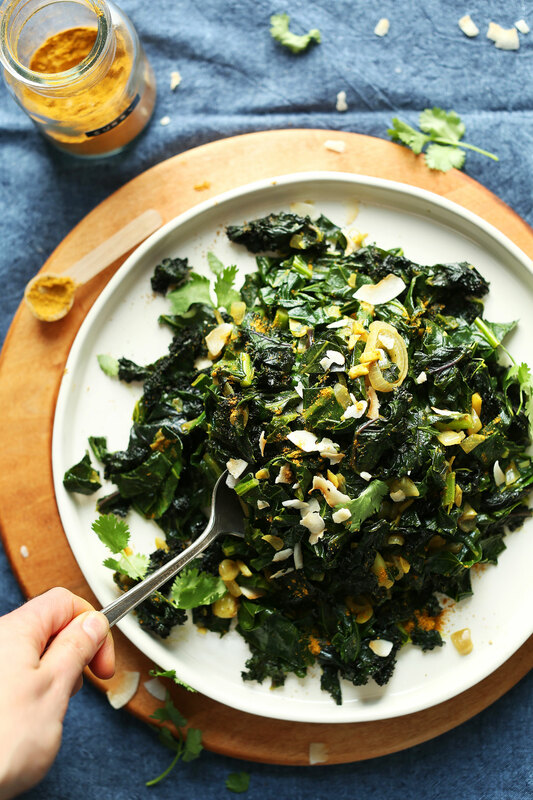 Wow this is such a good idea to cook greens in coconut milk, I’m sure they taste amazing! Will definitely be trying these out soon!